It has long been rumoured that the EFF was given patronage over lucrative City of Johannesburg tenders as a quid pro quo for working with Herman Mashaba’s DA-led administration. 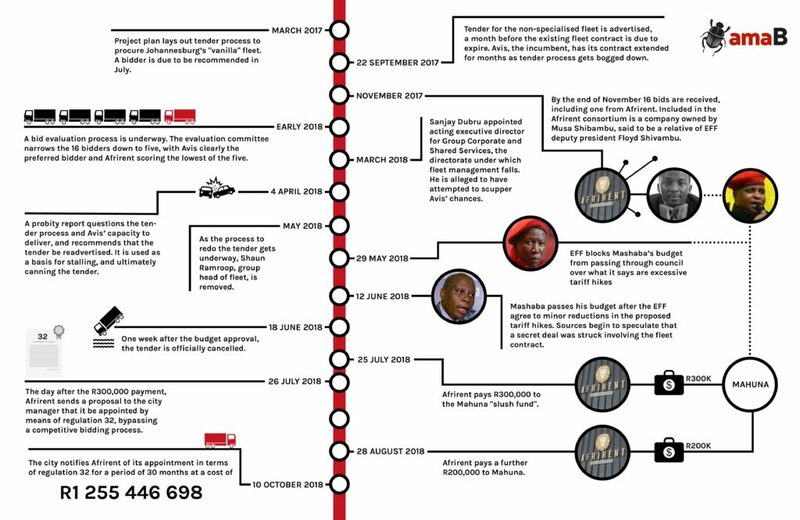 Now, an amaBhungane investigation shows that before controversially winning a mega-deal from the city, a fleet firm made payments to a company whose account was used for the benefit of Julius Malema and his party. Is this evidence of kickbacks to the EFF – or rather, as the fleet firm maintains, unrelated payment for services rendered? Financial records show that as the rain was about to fall for Afrirent, it transferred R500 000 in two tranches to a company fronted by Julius Malema’s cousin but used it as a “slush fund” for the EFF and Malema. Malema’s cousin Matsobane John Phaleng, sole director of Mahuna Investments, the company to which Afrirent made the payments, claimed it was for services rendered. Afrirent, however, stated via its lawyer that it had contracted Mahuna “to provide training and logistics for the delivery and implementation” of a contract it, Afrirent, had won from the department of rural development and land reform to supply tractors and farming equipment in Limpopo. Click on picture to enlarge graphic. Both may be true, but neither suggests that the city’s decision to contract via Regulation 32 resulted in value for money, or was rational. This included R430 000 which the Daily Maverick identified as designated for a Sandown property where Malema lived. After Malema had rented it for years, the EFF’s took ownership of it in June last year.